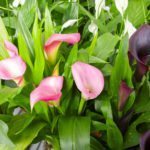 I grew over 50 calla lilies from seed but made the mistake of keeping the lid on too long & I believe they started to get damping off disease. They all looked really good but the green leaves just started falling over one by one, so I took them all out & carefully repotted into individual clean tiny pots. They're still struggling a bit & I can't tell when they want more water because the pots are so small. Also, I don't know if I should put them in direct sun and for how long being how young they are and given the tiny pots that I think would dry out too quickly. Once I get a couple leaves on them and get them into their own pot, what is the course of care? How much sun do they want at this point? Do I fertilize them at this point? Should I be keeping them outside at this point or should I bring them back in the house with the air conditioner on and being cool I thought the point was to try to avoid that and keep them warm. I want to keep them in a pot because I over winter them in their containers and it goes well for me.